But Don't Know How To Sell It? Are you sure your Ebook is Ready for Publication? Needless Dollars on Vanity Publishing? Discover where to go to get your ebook professionally edited for reasonable prices. Learn about popular ebook publishing options. Understand the 5 requirements for success and receive a very valuable pre-publication checklist. Learn how to package your ebook to give it a polished look and to position it for higher sales. Discover how to promote and sell your ebooks, and how to manage your expectations about ebook sales, and much, much more! Plus... When you order right now you will also receive the bonus ebook, "Mapping The Internet For Profits". This ebook shows you how to come up with profitable business ideas everyday of the week! You've got a full 60 days to try out the material. This is a no questions asked, no fuss money-back guarantee! You have nothing to lose and a whole lot to gain. 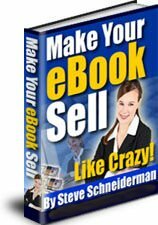 Make Your Ebook Sell is available for immediate download for only $18.97 ! (Less than the cost of one dinner out!) Click the button below to download your copy now. Ebook is in Adobe PDF format and will display on Windows PCs and Macs. P.S. : Click the button or link above to secure your copy of Make Your Ebook Sell right now! You'll be able to download it even if it's 2:00 am!